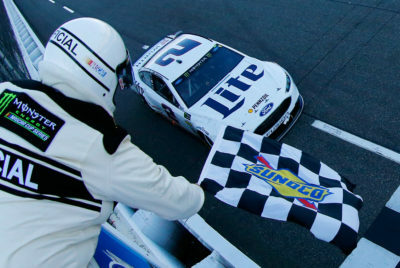 Brad Keselowski, driver of the #2 Miller Lite Ford, takes the checkered flag during the Monster Energy NASCAR Cup Series STP 500 at Martinsville Speedway on April 2, 2017 in Martinsville, Virginia. posted his 13th Top 10 finish in 24 races at Martinsville Speedway. It is his 3rd Top 10 finish in 2017. 3rd Place Car 24 Chase Elliott SunEnergy1 Chevrolet, started from 2nd place posted his 1st Top 10 finish in 4 races at Martinsville Speedway. 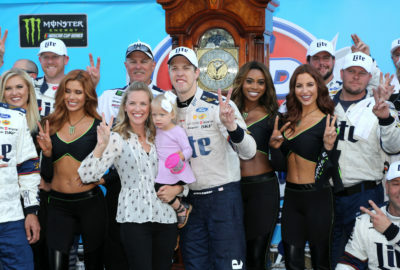 Brad Keselowski, driver of the #2 Miller Lite Ford, poses in Victory lane with his wife, Paige, and daughter, Scarlett, during the Monster Energy NASCAR Cup Series STP 500 at Martinsville Speedway on April 2, 2017 in Martinsville, Virginia. 11th place followed by 9th place Car 20 Matt Kenseth Tide Pods Toyota, started from 25th place. Lastly in the Top 10 was Car 17 Ricky Stenhouse Jr. Fastenal Ford, in the 10th place, started from 24th place. Erik Jones (12th) was the highest finishing rookie. Kyle Larson leads the point standings by 4 points overChase Elliott. 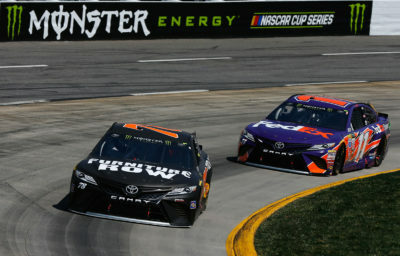 Martin Truex Jr., driver of the #78 Furniture Row/Denver Mattress Toyota, leads Denny Hamlin, driver of the #11 FedEx Express Toyota, during the Monster Energy NASCAR Cup Series STP 500 at Martinsville Speedway on April 2, 2017 in Martinsville, Virginia. The race had 14 Cautions for 95 Laps: 1st Caution on lap 71 for Car 17 Ricky Stenhouse Jr. Fastenal Ford and Car 27 Paul Menard Duracell/Menards Chevrolet Crash in Turn 3. 2nd Caution on lap 108 for Car 1 Jamie McMurray Cessna Chevrolet Crash in Turn 1. 3rd Caution on lap 124 for Car 21 Ryan Blaney Motorcraft/Quick Lane Tire & Auto Center Ford and Car 88 Dale Earnhardt Jr. Axalta Chevrolet Crash in Turn 2. 4th Caution on lap 132 for Stage 1 Conclusion. 5th Caution on lap 262 for Stage 2 Conclusion. 6th Caution on lap 280 for Debris in Turn 2. 7th Caution on lap 290 for Car 3 Austin Dillon Okuma Chevrolet, Car 5 Kasey Kahne Great Clips Chevrolet, Car 19 Daniel Suarez ARRIS Toyota, Car 41 Kurt Busch Monster Energy/Haas Automation Ford, Car 47 AJ Allmendinger Kroger ClickList Chevrolet and Car 77 Erik Jones # 5-hour ENERGY Extra Strength Toyota Crash on the frontstretch. 8th Caution on lap 298 for Car 41 Kurt Busch Monster Energy/Haas Automation Ford Crash in Turn 3. 9th Caution on lap 310 for Car 23 Gray Gaulding SunFrog.com Toyota Spin in Turn 2. 10th Caution on lap 335 for Car 15 Reed Sorenson Chevrolet Spin in Turn 3. 11th Caution on lap 392 for Car 33 Jeffrey Earnhardt Little Joes Autos/Curtis Key Plumbing Chevrolet Crash in Turn 2. 12th Caution on lap 408 for Car 32 Matt DiBenedetto Keen Parts Ford Crash in Turn 3. 13th Caution on lap 419 for Car 5 Kasey Kahne Great Clips Chevrolet, Car 10 Danica Patrick TaxAct Ford, Car 11 Denny Hamlin FedEx Express Toyota, Car 13 Ty Dillon # GEICO Chevrolet, Car 43 Aric Almirola STP Ford, Car 47 AJ Allmendinger Kroger ClickList Chevrolet and Car 88 Dale Earnhardt Jr. Axalta Chevrolet Crash in Turn 3. 14th Caution on lap 432 for Car 14 Clint Bowyer Haas Automation Ford, Car 20 Matt Kenseth Tide Pods Toyota and Car 78 Martin Truex Jr. Furniture Row/Denver Mattress Toyota Crash in Turn 4. 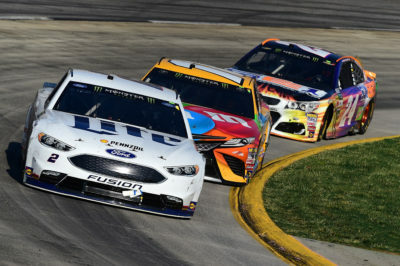 Brad Keselowski, driver of the #2 Miller Lite Ford, leads Kyle Busch, driver of the #18 M&M’s Toyota, and Chase Elliott, driver of the #24 SunEnergy1 Chevrolet, during the Monster Energy NASCAR Cup Series STP 500 at Martinsville Speedway on April 2, 2017 in Martinsville, Virginia. 443; Kyle Busch 444-457; B. Keselowski 458-500. 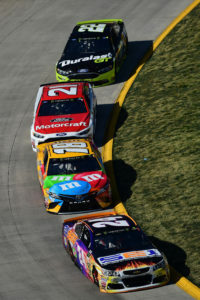 Leaders Summary (Driver, Times Lead, Laps Led): Kyle Busch 7 times for 274 laps; B. Keselowski 4 times for 116 laps; M. Truex Jr. 2 times for 42 laps; D. Hamlin 2 times for 24 laps; K. Larson 1 time for 23 laps; C. Elliott 2 times for 20 laps; J. Logano 1 time for 1 lap. 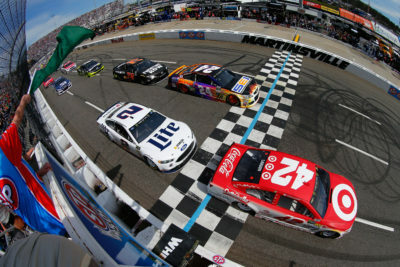 Kyle Larson, driver of the #42 Target Chevrolet, Chase Elliott, driver of the #24 SunEnergy1 Chevrolet, and Brad Keselowski, driver of the #2 Miller Lite Ford, lead the field to green during the Monster Energy NASCAR Cup Series STP 500 at Martinsville Speedway on April 2, 2017 in Martinsville, Virginia. Chase Elliott, driver of the #24 SunEnergy1 Chevrolet, leads Kyle Busch, driver of the #18 M&M’s Toyota, Ryan Blaney, driver of the #21 Motorcraft/Quick Lane Tire & Auto Center Ford, and Joey Logano, driver of the #22 Duralast GT Ford, during the Monster Energy NASCAR Cup Series STP 500 at Martinsville Speedway on April 2, 2017 in Martinsville, Virginia. Time of Race: 3 Hrs, 44 Mins, 59 Secs. Average Speed: 70.139 MPH. Margin of Victory: 1.806 Seconds. 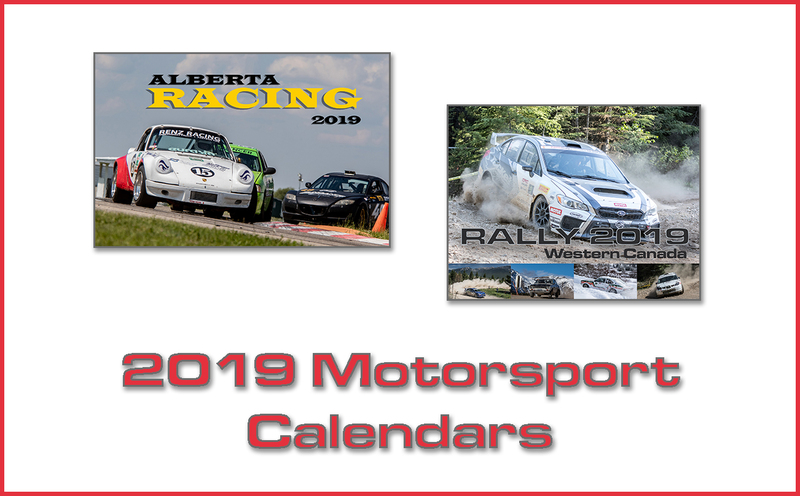 Race Comments: Prior the start of the race, the following car dropped to the rear of the field for the reason indicated: No. 19 (backup car). Failed to Qualify: N/A. Caution Flags: 14 for 95 laps. Lead Changes: 18 among 7 drivers. Time of Race: 3 Hrs, 44 Mins, 59 Secs. Average Speed: 70.139 MPH. Margin of Victory: 1.806 Seconds. American Ethanol Green Flag Restart Award: Kyle Busch, #18. Ingersoll Rand Power Move: AJ Allmendinger, #47 4 positions. Mahle Clevite Engine Builder of the Race: Toyota Racing Development (TRD), #18. Mobil 1 Driver of the Race : Kyle Busch, #18. Moog Go the Extra Mile: Kyle Busch, #18. crew chief Adam Stevens, 0.227 seconds. 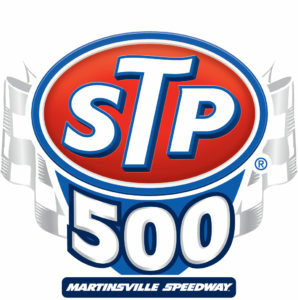 Sherwin-Williams Fastest Lap: Kyle Larson, #42. Sunoco Rookie of the Race: Erik Jones, #77.